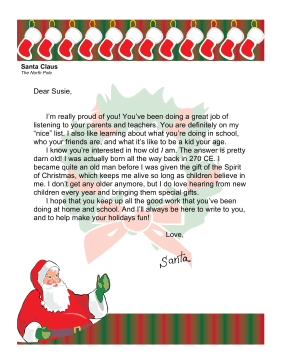 This letter from Santa talks about the immortal saint's age and history. I'm really proud of you! You've been doing a great job of listening to your parents and teachers. You are definitely on my "nice" list. I also like learning about what you're doing in school, who your friends are, and what it's like to be a kid your age. I know you're interested in how old I am. The answer is pretty darn old! I was actually born all the way back in 270 CE. I became quite an old man before I was given the gift of the Spirit of Christmas, which keeps me alive so long as children believe in me. I don't get any older anymore, but I do love hearing from new children every year and bringing them special gifts. I hope that you keep up all the good work that you've been doing at home and school. And I'll always be here to write to you, and to help make your holidays fun!